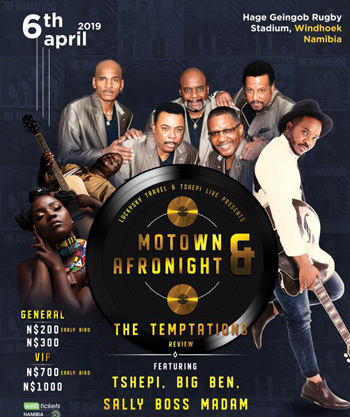 American vocal group, The Temptations, will for the first time perform in at the at the Hage Geingob Stadium 6 April. The group will be supported by local artists that will include; Sally Boss Madam, Big Ben as well as the sensational young Afro soul singer and guitarist from Botswana Tshepi . The Temptations, who released a series of successful singles and albums with Motown Records during the 1960s and 1970s will grace the Land of the Brave with good old music, Lucky Sky Travel and Tshepi Live Entertainment Event Manager, Evelyn Phiri-Saindi said this week. Over the course of their career, the Temptations released four Billboard Hot 100 number-one singles and fourteen R&B number-one singles. The Temptations was the first Motown recording act to win a Grammy Award for “Cloud Nine” in 1969 and in 2013 received the Grammy Lifetime Achievement Award. Lucky Sky Travel which is interested in growing business in SADC countries said the Temptations next stop will be in Lusaka, Zambia, on the 30 March. Early bird Tickets will cost N$200 and VIP N$700, while normal tickets will cost N$300 for standard and N$1000 for VIP. The tickets are all available at web-tickets, all Pick N Pay outlets and Lucky Sky Office upper floor in Townsquare. PreviousHow can devil’s claw help to alleviate poverty?